Private chefs who cook and clean after themselves may just be the next great F&B trend. A complete stranger is in the Doyenne kitchen. 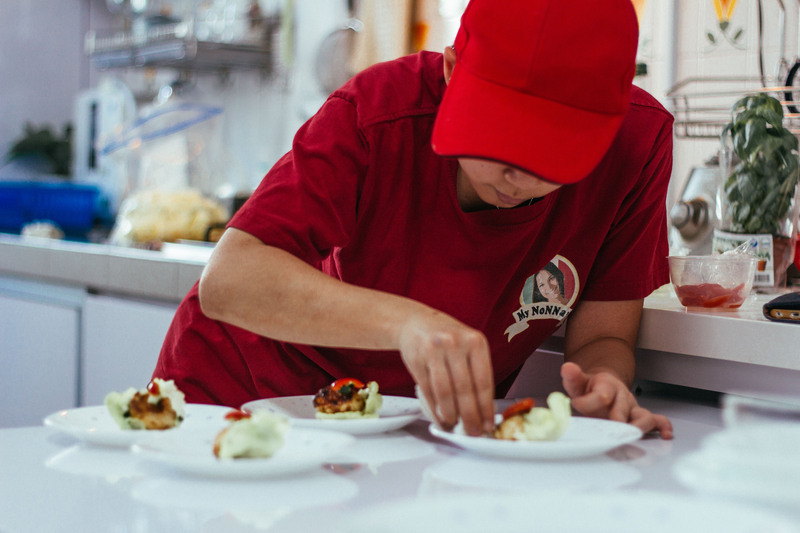 She carefully plates an antipasti of four seared, truffle-perfumed Canadian scallops, bedding them on a slice of lettuce before sprinkling cubed cucumbers and cherry tomato slices. This is Lydia. 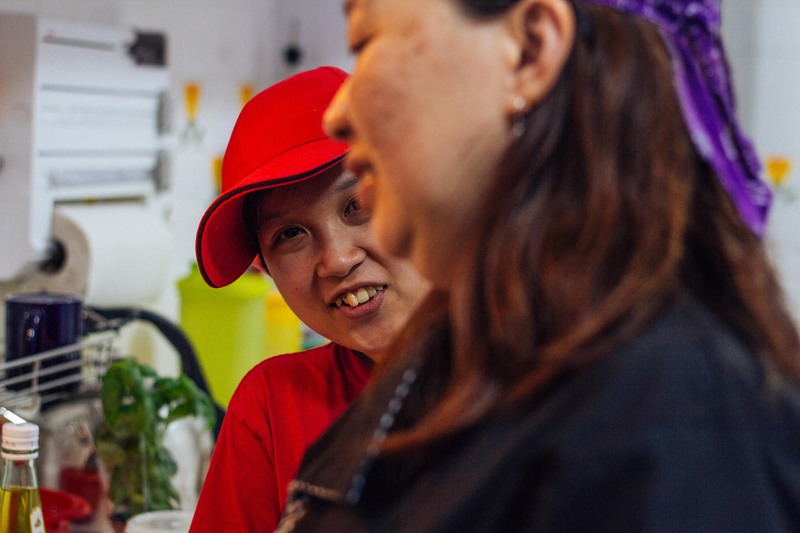 She is a special needs assistant to Chef Geraldine Tan of My Nonna‘s, a social enterprise specialising in Italian cuisine. My Nonna’s, which also has stalls in secondary schools and tertiary institutions, provides culinary training and employment to people with special needs, such as autism, intellectual impairments and physical disabilities. Today, Lydia and Geraldine – who prefers to be called Geri – are invited to whip up a meal for our private dinner party held in editor-in-chief ShuQi Liu’s home. The meal is booked through AppeDine, a lifestyle app connecting diners with F&B outlets, unique venue hires and chefs amongst other features. My Nonna’s is part of AppeDine’s stable of Chefs-on-Demand. Meant for all occasions, the chefs are an eclectic mix. There are hawkerpreneurs, bakers, French chefs, and established restaurateurs proficient in multi-course degustations. Users are encouraged to customise their menu according to their budget (ranging from S$28 – $128 per pax at time of writing). According to Geri, group house parties and wedding proposal dinners are her most common requests. The scallops, bursting with sweetness, are quickly wolfed down. Thankfully, this is just the start of our four-course meal. Geri frequently consults her big styrofoam box of labelled, freshly prepared ingredients and utensils as she hovers over the stove. She and Lydia operate independently without any supervision needed once they are let into the kitchen. Several days before, we used the AppeDine app to share photos of the editor’s kitchen, available appliances (stove, blender, kettle), fridge and pull-out table. Geri was also asked to prepare a gluten-free meal. We wanted to test a simple premise: an elegant, well-executed and accessible meal for millennials. No purchase of additional utensils needed, just pure fine dining in a home furnished with the bare necessities. Geri says that the most common items Singaporean households lack are a good pair of tongs, and a medium-sized strainer for pasta. 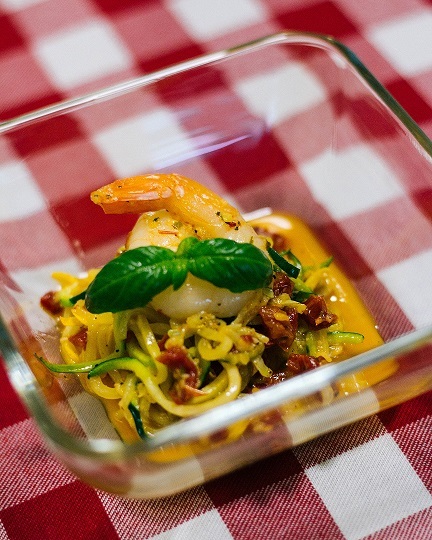 Our second course is sun-dried tomato “zoodles” and shrimp – zucchini sliced with a spiralizer to resemble noodles, a dish for the health conscious. A fresh aroma of sizzling garlic, olive oil and tomatoes soon fills the air. 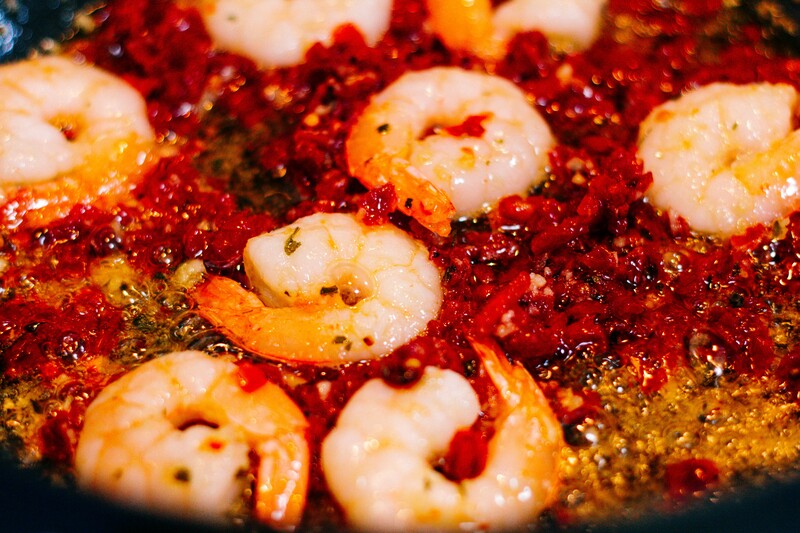 A secret ingredient in this dish is Murray River pink salt, which Geri scatters over the pan. She shares that My Nonna’s offers wine pairings too and recommends a Riesling to accompany this second course. Geri and Lydia’s professionalism shines. When a prawn rolls off the top of the pasta, Lydia swiftly restores its position with a pair of tongs and uses a kitchen towel to wipe away the stain. The zoodles are plated, adorned with a sprig of basil (snipped from a whole potted plant for freshness) and served in ten minutes. 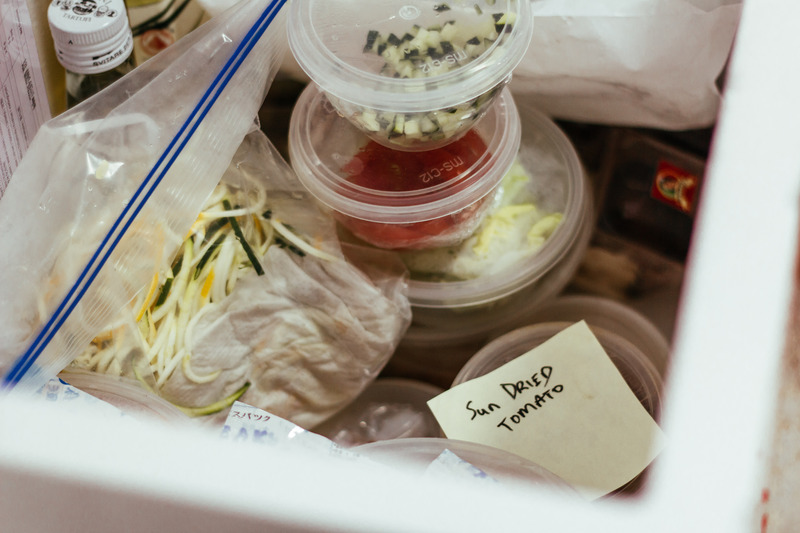 One of the most obvious advantages of hiring a chef-on-demand is the luxe factor of having your food freshly prepared in your own home and at your convenience. Food delivery services are only able to fulfil the latter. But the real convenience is how self-sufficient these chefs are. Geri and Lydia operate seamlessly, washing cutlery and utensils used from the previous courses while preparing the next. Geri shares an example of how she was once commissioned to prepare a private dinner, with the homeowner clueless about her own items. “She said, I don’t know what I have and don’t have, so just take a look and do your thing. I hunted for every piece of equipment, prepared the meal and cleaned everything up,” Geri says, joking that she often leaves kitchens cleaner than they were before her arrival. As she speaks, Alaskan king crab claws in ziploc bags are sifted out of the chiller. Garlic chopped to a fine mist and warmed with tomato puree and olive oil slides into the pan. 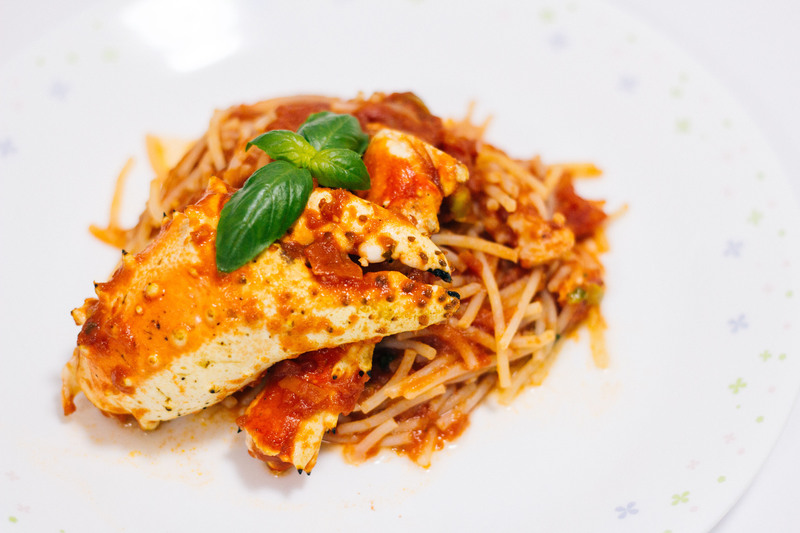 Spooned over sieved pasta, this sauce is rich and gentle. It doesn’t bully the freshly cracked claws, whose generous size helps distance La Nonna’s from other crab pasta artists in Singapore. Dessert is an alcohol-free Lavazza (the best coffee powder, according to Geri) tiramisu with biscotti. No detail is spared. Geri has tactfully swapped the commonly-used ladyfinger savoiardi biscotti, which has gluten, for a Amaretti variant. Of course, at this point, we protest and say we have no room for dessert. But Geri and Lydia both know we don’t mean it. Download AppeDine on the Apple App Store and Android Google Play Store. For more information, visit here.